In a bowl, beat eggs, sugar, oil and pumpkin. 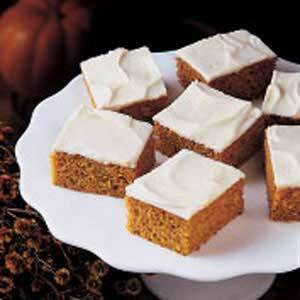 Sift flour, cinnamon, baking powder, baking soda and salt; gradually add to pumpkin mixture and mix well. Pour into an ungreased 15-in. x 10-in. x 1-in. baking pan. Bake at 350° for 25-30 minutes. Cool completely before icing.